Chandler, Ariz. – Plans to help make NASM-certified personal trainers even stronger independent business owners were announced today. Through a partnership with Net Profit Explosion (NPE), the National Academy of Sports Medicine (NASM) will provide certified personal trainers with key insights and resources to start, maintain and grow their personal fitness training business. NPE is a leading provider of business growth and entrepreneurship consultation in the U.S. and internationally. 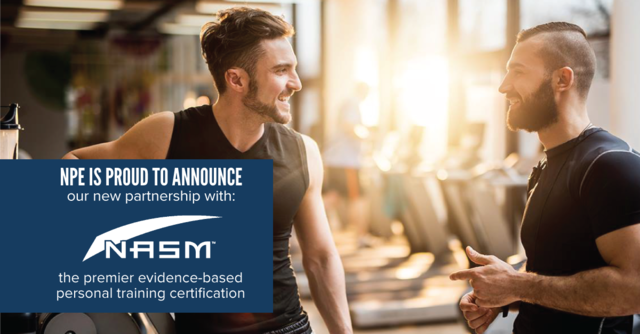 The partnership pairs two premier leaders to produce unique and immediate benefits to existing and future NASM-certified personal trainers. To learn more about NASM, visit www.nasm.org or call 1.800.460.NASM. For news, industry insight and promotions, subscribe to the latest issue of The Training Edge and follow them on Facebook or Twitter. To learn more about NPE, visit www.NetProfitExplosion.com or call 1.888.866.4998. For fitness business education, news and promotions, register online at www.NetProfitExplosion.com and follow us on Facebook or Twitter.